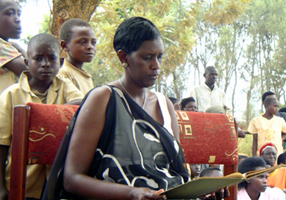 Ten years after a horrifying spiral into genocide, Rwanda is, in some ways, a model of feminist opportunity. Its new constitution mandates that women hold at least 30 percent of all positions in government and other decision-making positions. The 2003 elections trumped even this ambitious goal, swearing in a new legislature that is approximately 48 percent female. Gender quotas are applied because there is marked gender inequality in elected bodies. With quotas, the aim is to guarantee the election of a number of women simultaneously, instead of the election of a single “token” woman. Quota setting is still rather controversial. The largest body of support for quotas comes from those who are not included in the decision-making bodies — that is, women. Opponents of quotas claim they are discriminatory and undermine the ethos of equality; women are lent a hand because of their symbolic value, not because of their talents, qualifications, and experience. 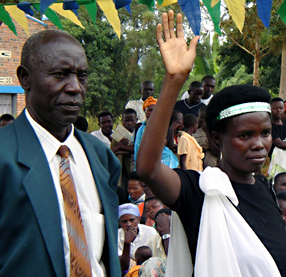 Rwanda is not the only country with gender quotas in the constitution or in other legislation. In the last ten years many governments have opted for this legal strategy in an effort to include more women in political decision-making institutions. Instead of using quota legislation, we also find countries where political parties voluntarily implement party quotas — as political parties generally dominate the selection process of candidates for legislative office. Voluntary party quotas can be found all over the world. In Scandinavian countries such as Denmark, Sweden, and Norway, political parties introduced gender quotas in the 1970s. Many believe that those early quota requirements are responsible for the many women working as political representatives in those countries today. Because quotas in political parties are self-imposed and temporary measures, their very success can also be a reason to eventually abandon the quota policy. Danish left-wing parties, for example, cancelled the quota system in the mid-1990s. A political representation of about 40 percent women is now common there, and parties need no extra stimulus to add more women to their ranks. In those countries where there has been hardly any progress in women’s political representation, governments (instead of political parties) have taken up the challenge and adopted quota legislation for political offices. In some cases, like in Rwanda, the constitution has been amended either with explicit gender quotas for certain political functions or in such a way that makes it possible to pass national legislation such as electoral laws demanding substantial representation of women in politics. Forty-one countries have constitutional quotas or electoral quota laws in effect as of 2004, according to the Global Database of Quotas for Women . In four of these countries, the regulations are only valid for the local or regional political bodies. See the full list to learn more about which countries have quota laws and their electoral success rate. In addition to Rwanda, five other African countries — Kenya, Tanzania, Uganda, South Africa, and Morocco — introduced gender quota requirements. The constitution of Tanzania states that a certain number of parliamentary seats (not less than 20 percent and not more than 30 percent) are reserved for women. These seats are distributed among the political parties in proportion to the number of seats awarded in parliament. In South Africa a municipal law stipulates that 50 percent of all candidates for the local councils have to be women. In Europe, France adapted the constitution to add a gender quota in 1999, while the government of Belgium already passed an electoral law in 1994 guaranteeing that one third of candidates on the lists would be women in 1999. In other southern European countries, the passing of quota legislation is the subject of intense debates. The Portuguese parliament of 1999 rejected a government proposal to impose a maximum of 75 percent of all eligible places on the lists of candidates go to women over the next two elections. The quota would have been 66.7 percent. Although the law did not pass parliament, the debate on the issue of women’s political representation shook the parties awake, resulting in an increase from 13 to 19 percent women MPs after the election of 2001. In Greece two government bills passed the Greek parliament in 2002 that required a compulsory participation of at least one third of both sexes on the list of candidates for municipal and regional elections. The quota law did exert an impact on the results of the local and regional elections held in 2002 and in 2003. The percentage of women candidates on the lists for the regional elections increased from 14 percent, in 1998, to 34 percent in 2002. The percentage of women elected in the regional councils went from 11 to 18 percent. At the local level, the percentage of women councilors increased to 12 percent in 2003 — up from 7 percent in 1998. Seven Asian countries have also implemented quotas in recent years. India’s constitution now provides that 33 percent of all seats in the local political bodies are to be reserved for women. In 2002 Pakistan also added a law mandating that 17 percent of all parliamentary seats are reserved for women candidates. In the Netherlands, the parliamentary election of 2002 resulted in a representation of 21 percent women MPs. In Latin America the parliaments of six countries passed similar laws. In Bolivia, for example, an electoral law with a quota of 30 percent was introduced in 1997. The choice of the percentage differs widely among all these countries. France is the only country that opted for parity: 50 percent of the members of parliament should be women. In the other countries it varies between 3 percent (Kenya) and 40 percent (Costa Rica). In 18 of the 41 countries with quota laws, the minimum has been set at exactly or approximately one third (30 or 33.3 percent). Thirty percent is also the percentage of choice for international organizations, like UNIFEM (United Nations Development Fund for Women), that push for greater opportunities for women worldwide. A quota of one third seems to be a compromise between the normative view that delegates represent all citizens — in which case the gender quota should be 50 percent — and a more pragmatic view that takes as a starting point the current rate of women’s political participation. The danger exists, however, that when the quota is set too low, selectors will use the figure as a maximum instead of a minimum. Are quotas an effective way of increasing political power for women? Effectiveness in terms of participation rates of women in parliament depends on many different factors. A first issue is how restrictively are the laws written? Is there a penalty when parties do not adhere to the quotas stated in the laws? In some cases, like in Paraguay and Mexico, the electoral office does not accept ballots that do not meet the quota requirements, but in other countries, such as South Africa, there are no sanctions at all. Similarly, there are many examples of parties reaching the quota of female candidates set by the law, but failing to get the same percentage of women into the parliamentary party. This situation brings up the second issue regarding the writing of quota laws: is there a stipulation regarding the placement of women on the list of candidates? When party lists are used as a balloting method, women may fail to win seats due in part to the actual placement of women candidates at the bottom of party lists. In plurality systems where only one candidate for each party competes for the constituency seat, political parties can decide to “give” un-winnable constituencies mainly to women, while male candidates get the successful constituencies. Such was the case in the French parliamentary elections of 2002: Despite the fact that 38 percent of all party candidates were women, only 12 percent of those elected were women. But overall, quotas have had a positive effect on the selection of women candidates. For one, party leaders put more effort into their search for potential women candidates. And quotas encourage women aspirants to put themselves forward as candidates. Analysis of countries where quota laws have been introduced finds that parties have presented more women candidates than previously and actual representation figures have indeed increased. For this reason it is more than likely that other countries will soon be following the example of those who have imposed gender-balance quotas. This database on the use of voluntary party quotas and quota legislation is composed by the University of Stockholm and the International Institute for Democracy and Electoral Assistance (IDEA) and can be found on www.quotaproject.org. M. Htun and M. Jones, “Engendering the right to participate in decision-making: electoral quotas and women’s leadership in Latin America,” in. N. Craske and M. Molyneux (eds), Gender and the Politics of Rights and Democracy in Latin America: England, Palgrave, 2002, p.32-56; B. Marques- Pereira, La Representation Politique des Femmes en Amerique Latine, Brussels, L’Harmattan, 2001. Monique Leyenaar is professor of political science at the University of Nijmegen, Netherlands. She also works as a consultant for the Dutch government and participated in the European Expert Network on Women in Decision Making. She has published extensively on the subject of women and politics. Her most recent book is POLITICAL EMPOWERMENT OF WOMEN: THE NETHERLANDS AND OTHER COUNTRIES, published in 2004 by Martinus Nijhoff Publishers.